These homeowners had gotten tired of the border around the top of their bathroom. But some borders can be the Devil to remove. So this savvy lady came up with a simple and handsome alternative. She painted the border to match her wall color. Then she added painted wooden trim around the bottom, to cover the edge of the border. I think it looks great, and you would never know there is wallpaper under there. 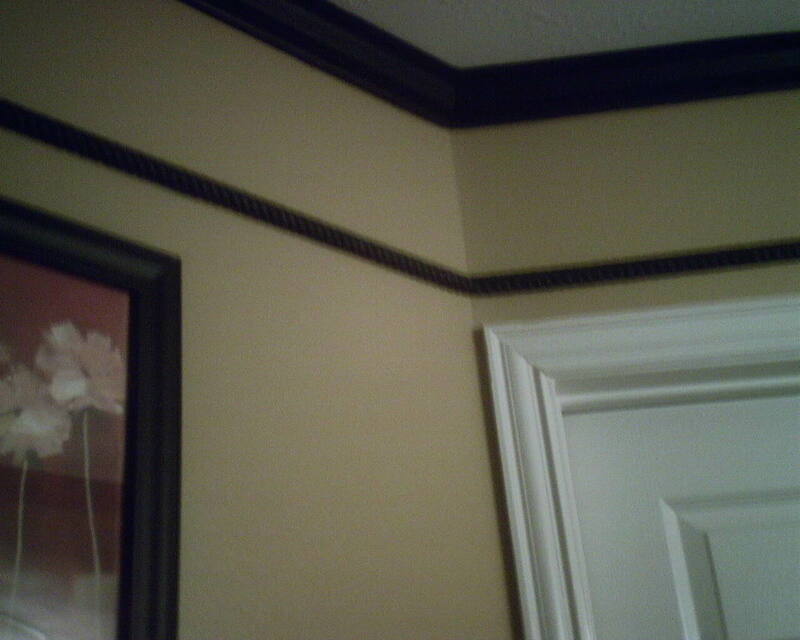 Another option would be to paint the border and the wood trim semi gloss white, to match the crown molding. This would give the effect of really wide crown molding, and look quite elegant. 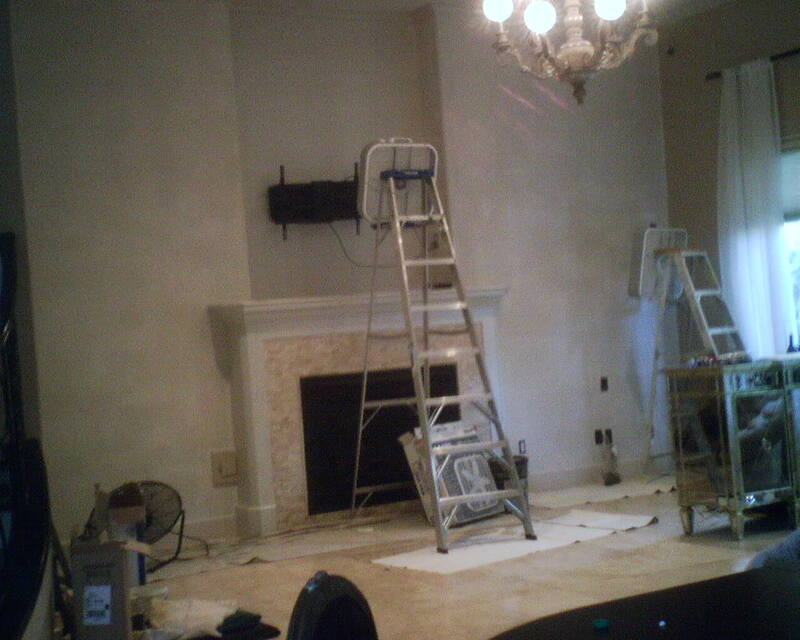 These walls have a thick texture that needed to be smoothed before I could hang the new wallpaper. 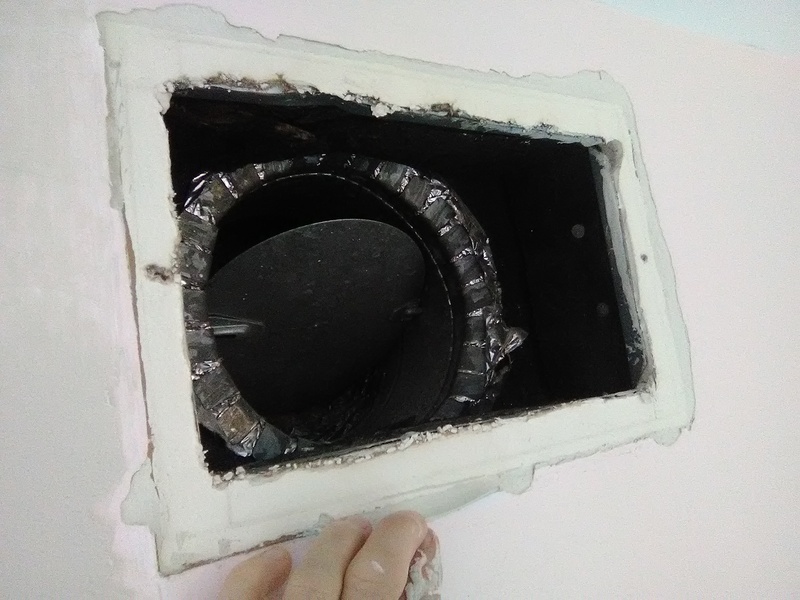 In the photo, I have finished skim floating the walls with mud (joint compound). Now they need to dry, before I can sand them smooth. The homeowner has the air conditioning cranking away, which helps to pull humidity and moisture out of the smoothing compound. In addition, I have set up fans to move air around the walls. Two box fans are affixed to the shelves on ladders (secured with bungee cords), and one very powerful fan is sitting on the floor aimed up at the wall. Sometimes the joint compound can be induced to dry in an hour or two this way. But in this case, because the texture was so thick, and because the semi-gloss paint beneath the smoothing compound slows drying, I needed to let this set-up run for a few hours. The fans sped up the drying process, and once they were turned off, the walls were left overnight to dry further. Come morning, I was able to proceed with sanding and the rest of the prep and installation of the new wallpaper.